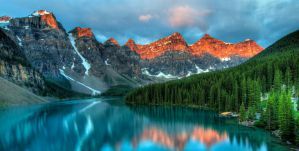 Banff is a popular tourist town in the Alberta Rockies region of Alberta. It's one of two towns that is located within Banff National Park and it is about an hour and half west of Calgary. It's also part of a UNESCO World Heritage Site. The town is touristy and there are a number of seasonal workers who spend just a few months in the area. The scenery is spectacular but it is hardly isolated. You can expect large tourist crowds, particularly during peak seasons. There are also many tourist amenities available including a wide variety of restaurants and clubs. The nearby ski areas include Norquay, Sunshine, Nakiska, and Lake Louise. Although there is a decent amount of accommodation in and around Banff, early reservations are a must. During the popular winter and summer months hotels and hostels can fill up really early. You'll find a good concentration of accommodation options along Banff Avenue or on Tunnel Mountain Road. How much do hostels in Banff cost? A great party hostel for backpackers, solo travellers, and small groups. Samesun Banff is a centrally located hostel that is near both the entertainment and nightlife areas as well as the mountain trails and the greyhound station. Many places that you might want to visit around town are walking distance, so you don't have to stand in the cold waiting for the bus. The hostel is clean and comfortable and it has a social atmosphere where it's easy to meet other travelers who want to experience everything that Banff has to offer. The hostel also has an on-site bar, Beaver Bar, where you can enjoy karaoke, bingo, and weekly trivia nights. Guests can also take advantage of any number of amenities including free wi-fi, free breakfast, luggage storage, and travel information. The hostel has six, eight, ten, and fourteen bed dorms to choose from. Female only and mixed rooms are available and weekly rates can help you keep prices down. 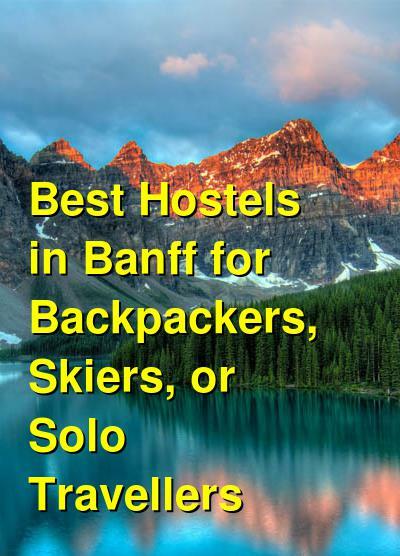 If you're looking for a fun and social environment, then this is a great hostel in Banff. A great party hostel for solo travellers, backpackers, or long-term visitors. HI Banff Alpine Centre is another popular hostel in Banff. It is an affordable and fun place to stay that has all kinds of activities and amenities that guests can enjoy. There's a foosball table and darts, and the staff organize nightly events such as Jam Night, Karaoke Night, and more. If you want to prepare your own meals, there are two different shared kitchens that you can use. The hostel offers discounted ski packages and a free bus pass for the local transportation system. There are also special packages for long term visitors. Private rooms include twins and doubles, and dorms include six bed rooms that are either male only, female only, or co-ed. A rustic hostel that is great of wilderness lovers and ice climbers. HI Rampart Creek is another great option for backpackers and budget travelers to Banff. The hostel is perfect for people who want to experience the area's unspoiled wilderness. It's close to many great hikes, waterfalls, and viewpoints, and it is a great place to stay regardless of the season. During the summer months it is a beautiful and scenic hostel that is great for wildlife viewing. During the winter months it is great for ice climbing and enjoying the stunning beauty. This is a remote hostel that has no phone, electricity, or running water. There are outhouse toilets but no showers or flush toilets. It's truly a hidden gem for those who want to experience Banff's incredible outdoor beauty. It's also very affordable and a wonderful value for the area. A good hostel for backpackers and outdoor enthusiasts. HI Lake Louise Alpine Centre is another great hostel that has impressive vaulted ceilings, a nice outdoor patio, and cozy fireplaces. There's also a sauna and an on-site restaurant, or a full kitchen if guests prefer to prepare their own meals. The hostel is perfect for backpackers, solo travelers, groups, or couples who want affordability and value without sacrificing comfort and quality. The hostel is near many great hiking trails and it offers amazing views of the surrounding mountains. There are many great activities nearby including horseback riding, biking, or simply relaxing. If you're in town during the winter months, the hostel is just minutes from Lake Louise Mountain Resort, which offers world class skiing. Cross country skiing, dog sledding, and ice climbing are also nearby. The hostel has dorms that sleep either four or five people. There are also male only, female only, and co-ed rooms to choose from.